In the present competitive world, every company wants to win the race and stand out of the crowd. In order to do the work efficiently, companies allocate the work to a third party service provider to be done with the specific time limit. This concept is known as Business process outsourcing (BPO), it is a process of contracting people from a third party service provider to do non-core work of the organization. Presently, there are many BPO’s who hire people in a huge number every year to meet the demands of the industry. Following mentioned are few International bpo interview questions and steps for how to prepare for voice process interview. Getting a job in an international BPO is not very tough when it is prepared in a systematic manner. The expectations of a recruiter for a BPO, would be probably only on your excellent communication skills with basic computer skills. Below we discussed about bpo interview rounds which are conducted in BPO interview process. Here are the various steps of interview process to enter into an international Business Process Outsourcing company. This question might sound silly, but the real intention is to know how you describe your day to day activities with ease. So be casual, and keep it minimal. This question is to know how long would you stay in this job, as well as to know interests and the way you put forward your thoughts. Never tell money as a factor, even though it might be a reason. Talk about the growth of BPO over the years which will eventually show your interest. Keep it short, and something interesting, show a positive attitude and use right words to explain your day to day activities. Remember they do not know whether you speak truth or not, but they only want to know how confident you are, and our command over the language. Here are few tips to speak well. Try to maintain your confidence level and energy while speaking. Never rush or be low in voice while answering the questions. When you are not clear with the question, ask them politely to excuse and repeat. Do not panic, if they try to suppress you when answering. All they want to check is your patience level. Do not fake your accent, as it will surely make you caught at some point. This is also equally important compared to accent, and it would be only to test whether you know the fundamental terminologies of BPO. Here are the few questions, which are repetitive and important with respect to international Business Process Outsourcing. a. Can you tell what is the difference between onshore and offshore outsourcing? The process of outsourcing, were outsourcing happens with some outside company but within the same country. Whereas, offshore outsourcing is a process where company outsources employees for the organization from the third party organization from different country where they do not develop the product. b. Can you tell what is the difference between BPO and call center? Business process outsourcing is methodology where they outsource people from third party organization to perform non-core jobs, whereas the main job of a call center is to deal with business clients through voice calls. c. What are the different categories in BPO and which one do you prefer working? Business process outsourcing can be broadly classified according to the various divisions of the organization. And a job seeker can answer this question with the types and according to their interest they can answer the division they want to work. d. Which one has better future, voice BPO or a non voice BPO? Justify your answer. Voice BPO is a process where an employee directly deals with the clients through voice calls. Whereas, a non-voice BPO is a process of interaction with the client through mails or documentation process. This question can also be answered by thinking twice about your interest. As, few people might feel they are good at social talks or some might be interested and good at documenting the entire work. This aptitude test is very simple for a Business process outsourcing interview. This test would be for around 30 minutes. In this process the candidate’s knowledge is tested about general analytic ability, English vocabulary and logical ability. There are lot many samples interview questions and answers available in the internet. Only around 60% of score is expected to clear this round. Group discussions are been conducted in many BPO interviews to test the speaking ability, and also the way you deal the world related issues. Here the candidate will also be tested about the knowledge related social welfare, your outlook related to world happenings etc. Make sure you prepare the basic topics available around the internet to clear this round. This test is conducted to test the basic computer knowledge of the candidate, and their typing speed. It is very important to clear this round as most of the job role would be involved in the usage of the computer. Most of the back office jobs involve in usage of the computer, so it is essential to know the fundamentals of usage of computer. In case if you are applying for a technical related Business Process Outsourcing job, computer hardware knowledge will also be tested. Major purpose of the computer test is to test your typing skills, and also test the basic fundamentals of Microsoft office application. There are two types of computer tests to analyze your skills according to the specific type of Business Processing Outsourcing job you apply. For example, technical computer knowledge will be tested if you are applying for a technical query related Business Processing Outsourcing Job. This might be the last part of the interview, here in this round the candidate will be asked some basic questions about themselves, as well as they will be tested about their interest to join the organization. 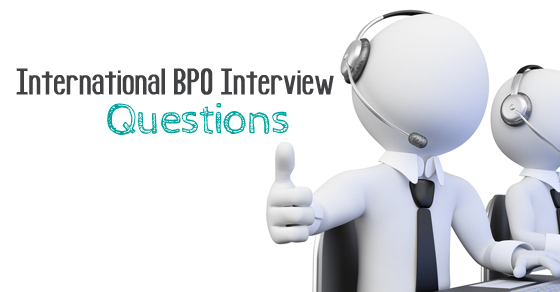 The following mentioned are few international BPO interview questions. This question might look simple, but this is very important question as it might take the rest of the interview. So try to answer it simple as well as very meaningful. Never exaggerate or give too many information as it might be complicated to answer all their views about yourself. b. Tell me why you wanted to join BPO. Give a straight forward answer with a positive note. Do not put your answer related to the salary as it might make you a negative impression. Make sure your answer should be the way, which is related to your future goals. c. Tell me your preference shift you would like to work. Here to this question you can answer to your preference, but make sure your answer should be that you are flexible and do not be too strong about your preference. Be polite and put your choice of preference. d. Do you have any expectations related to your salary? Try to answer this question in a very casual way. Do not try to impose your expectations on them as they would surely reward only the salary which is according the company’s salary structure. So be modest answering this question, and let them take their choice. e. Tell me your future goals. This questions should be answered in a way that it is related to your future commitment towards the company. Try to showcase your interest towards the goal. You can answer this question like related to the job designation you wanted to be in this company in future. End of the day, all they want is the commitment from the candidate. f. What do you know about the BPO industry? BPO, like the term tells happens to be an essential part in eveny business where you have to outsource a certain task to companies which specialize in taking care of specific kinds of businesses. It also includes office processing, getting enough customer support, medical transcription which give you technical support by the chat, mail and voice. The industry has grown by bounds and leaps in the last few years. India is one of the best destinations which has skilled people that educate themselves and have a better workforce. g. What makes you good for this job? Why should we consider you as a good candidate? First of all, I have excellent skills of communication. I am enthusiastic and have adapted myself to different schedules of work. There are two kinds of prerequisites for such jobs. Also I will be able to work very easily during times of stress and that I will never allow it to get the best of me. I am calm, cool and composed and whenever I feel pressurized and check that my work never bears the brunt of any difficult situation. Therefore Id like to believe I can do a better job than others. h. In what way do you think you can make a contribution to our company? I am a person who believes that each employee’s productivity contributes to the overall productivity of the organization. I will work with dedication and maintain good relationship with my fellow employee and my superiors. I will try to live up to my expectation of my superiors and perform my tasks with responsibility and proficiency. I strongly believe in mutual growth both for the company and myself. i. What are the common risks associated with BPOs and how can you cope with it? BPOs usually have a lot of personal information that come with huge data. The breach in any security system would lead to leaks in the information handed over to me by the customer could spoil the reputation of the company, especially if it doesn’t have a good purpose. To keep away from such risks, the associates should never allow themselves to carry any external hard drives or any flash drive when they are on board. When login ids of employees have been done away with on an immediate basis so that you cant misuse them to get information from the customer from anywhere. You may also install additional software at the same time so you can protect your computer from getting hacked in the future. j. Can you handle work pressure? I never shy away from work. I can handle stressful situations and make sure that the work output I do has not been compromised. Patience is an attribute which helps others deal with difficult circumstances in a smart way and I am definitely one of them. If you are going to speak about my job, I know it requires me to be very patient and handle my employees like a professional and I can assure you I am very much capable of that. My mindset is quite flexible and can adapt to any difficult situations. Attending an interview will never be tough, when you concentrate fully during the preparation. International BPO’s are fast growing as the need of the industries keeps increasing. Only talented people with multitasking ability are wanted in this fast moving pace. Follow the simple rules and keep yourself fully prepared to attend the interviews. And if you have feedback regarding the post, do let us know more in the comment box below. On that note, good luck!